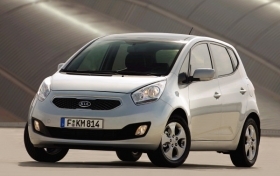 The Venga is helping Kia boost its European production. Strong demand for models from Hyundai, Kia and most premium brands helped European assembly plants produce the second-largest number of cars of the year in May. Overall European production was up 7 percent in the month to 1,382,275 units, according to estimates from J.D. Power Automotive Forecasting. The most productive month of 2010 was March, when 1,584,431 vehicles were made. Through five months European production is up 23 percent to 7,141,624, J.D. Power data shows. Kia's May production was up 41 percent to 16,051 units and its volume through five months is up 50 percent to 84,251 vehicles. The Korean brand is getting most of its output boost from its new Venga. Kia has made 19,376 units of the small minivan through five months, which means the Venga accounts for 69 percent of the automaker's 28,053 unit rise in production so far this year. The Venga was designed and engineered by Kia in Germany and is made at Kia sister brand Hyundai's factory in Nosovice, Czech Republic. Hyundai's production was up 47 percent in May and 71 percent after five months thanks largely to high demand for the new ix35 SUV, which debuted in the spring and replaces the Tucson, and the i20 subcompact. Porsche, Mercedes-Benz, BMW, Audi, Aston Martin, Lamborghini and Land Rover all increased their May production volumes by double-digit percentages.